Hi there! 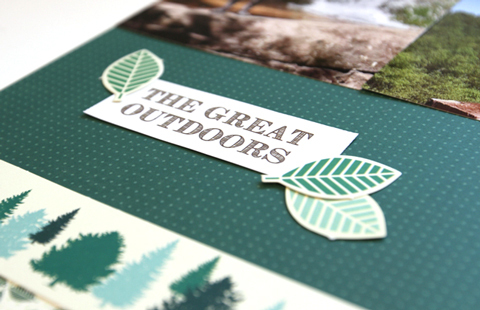 Stephanie here sharing a layout that features the Summer Woods collection/June Club SEI scrapbooking kit. The forest and camping design reminds me of the Pocono Mountains here in Pennsylvania. I'm not much of a camper, but recently went on a biking day trip in the Poconos. As soon as I saw this kit, I knew I wanted to use the papers and embellishments to scrapbook my biking adventure. I'm all for keeping layouts "CAS" (clean and simple). Printing only 4x6 photos helps me put together a layout in no time at all. Using a subtle, almost-solid background and monochromatic colors (all greens here) also helps achieve the CAS look. 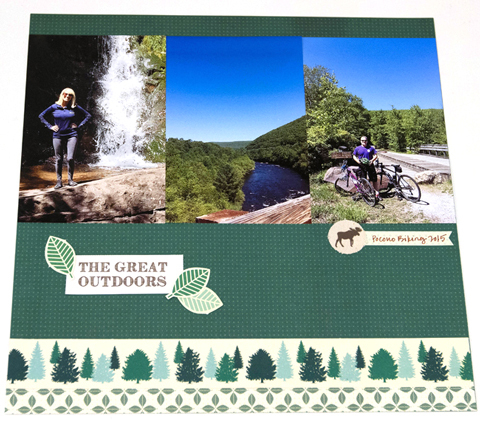 Whether you're camping, biking, or headed on a road trip, this kit is perfect for celebrating those summer memories made in the great outdoors!